The Jolly Jumper Sun Cling is an easy to use super sun shield providing your child protection from the sun's glare & UV rays. The dual-mesh material is easy to install and clings to any vehicle window. It provides shade from the harsh sun without blocking the view. This innovated product makes any car ride more enjoyable! 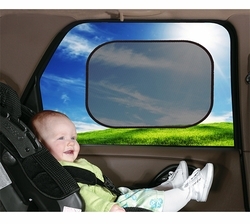 Protects your child from exposure to glare & UV rays.